Another great idea (via CoolMomPicks) brought to you by some innovative Mamas. 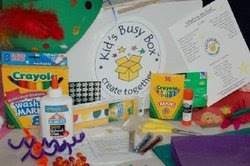 It's called the Kid's Busy Box. It's a ready-made art kit, complete with 20 craft ideas, materials (feathers, glitter, sand--make sure the hand-vac is charged and at the ready!) and all the top shelf art supplies you could want! Every Mama knows a good project will go a long way. This busy box might just buy you enough time to cook dinner in peace! Better yet, order take out and do the project together.